Water activities of all sorts are high on the list of favorite recreational pursuits in the Palmetto State. Summer water fun includes swimming, boating, fishing, kayaking, and water-skiing, both along coastlines and on inland waterways. Because of its generally mild climate, boating in South Carolina is enjoyable nearly year-round. Just like the state requires vehicles on roadways to have specific safety features and equipment, boats must as well. 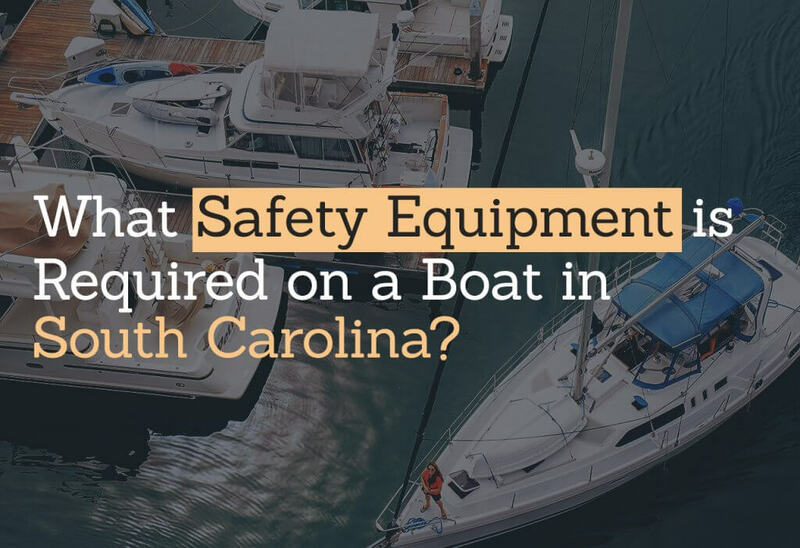 Before launching any watercraft in South Carolina, check to ensure you have all the required equipment necessary for a safe boating experience. ALL boats, regardless of size, plying South Carolina waters must have a Coast Guard approved life jacket or vest available for each person on board. All children under the age of 12 must wear the life jacket, not the popular swimming pool ‘floaties,’ at all times when on the boat. Boats over 16′ in length must also have a throwable floating device. Place an approved, hand-held fire extinguisher somewhere accessible and inspect it on a regular basis. There is nothing worse than grabbing a fire extinguisher only to find it empty or non-functional. You may not think an extinguisher is essential in a small aluminum boat but keep in mind – where there is fuel (gas) a fire hazard exists. Between the hours of sunset to sunrise, navigation lights must be used both offshore and on inland waterways, such as rivers, where traffic may be an issue. These lights should be of brightness to make your boat visible to other boaters, thus avoiding a possible collision. These are mainly for boats on coastal waters but can come in handy on any waterway to signal others in case of an emergency or break down. Again, mostly for use in coastal waters, these are attention-getting on any waterway. All boats less than 39.4′ should have one or more of these noise devices that is audible anywhere from 1/2 mile up to 1 1/2 miles. A good sturdy rope, preferably nylon, comes in handy in case of a breakdown requiring a tow. The unwritten rule of boating requires any boater to assist other boaters who need help. This one is self-explanatory. Having a kit on board means you can tend to cuts, scrapes, and fish hooks quickly, reducing the chance of infection. A radio or satellite phone can get help in a hurry. Depending on where you are, you may not have a cell signal. Before you head out on the water this summer, double-check to make sure you have the required gear aboard. Also, make sure you’re protected with a superb SC boat insurance policy from the best insurance agent in Greenville. Call us today to request your free quote!